Republished 11:40 a.m. September 12, 2016, to correct the graph title. Interruptions in electricity service vary by frequency and duration throughout the country across the many electric distribution systems that serve roughly 145 million customers in the United States. Although some distribution customers have backup generators that provide auxiliary power, most customers are simply without electricity when outages occur. The reliability of electricity supply systems is typically measured by considering the duration, frequency, and scale of service interruptions. Many of the standards in reporting these metrics were initially developed by the Institute of Electrical and Electronics Engineers (IEEE), a professional trade association for electric and information technologies and related fields. Most utilities reporting outage data use the IEEE standards, but some utilities have developed other approaches. For those following the IEEE standard, outage frequency and duration values are reported to EIA for any interruption lasting longer than five minutes. Utilities may designate if these outages occurred during major events, which can include snowstorms, hurricanes, floods, or heatwaves. Utilities can also designate periods of outages that differ greatly from its five-year history as a major event. Not all utilities are consistent in what they consider major events. For instance, a snow storm may be considered a major event by a utility in Virginia, but not by a utility in Maine. Major events are relatively rare, but they can result in longer outages. In the figure above, data on the frequency and duration of outages are shown for three broad categories of distribution utilities: investor-owned utilities (IOU), cooperative energy utilities (co-ops), and municipals. IOUs are owned by shareholders, co-ops are owned by members, and municipals are owned by cities. In 2015, utilities in these three groups that reported their outage information collectively made up 28% of all utilities but accounted for about 72% of electricity sales in 2015. In 2015, municipal utility customers experienced the lowest instances of power outages in both frequency and duration, averaging one outage and about two hours of interrupted service. 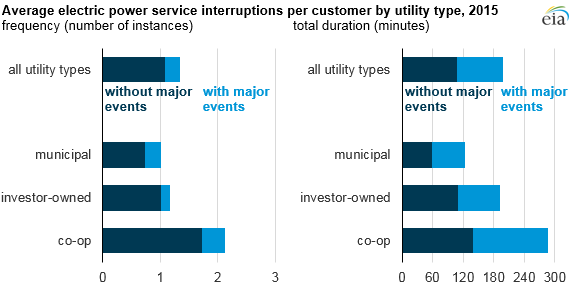 With major events factored in, investor-owned utilities' customers averaged slightly more than three hours without electric service, while co-op customers averaged nearly five hours without power. Co-op customers, on average, experienced about twice as many outages as customers of investor-owned and municipal utilities. Factors such as weather, population density, and tree density also affect utilities' ability to maintain service. For example, co-ops are generally suppliers to rural homes with more powerline miles and trees per customer, increasing the likelihood that distribution lines will be affected by storms. Municipalities are more likely to serve customers living in higher-density urban areas, which have fewer powerline miles per customer and, in some locations, underground distribution lines.